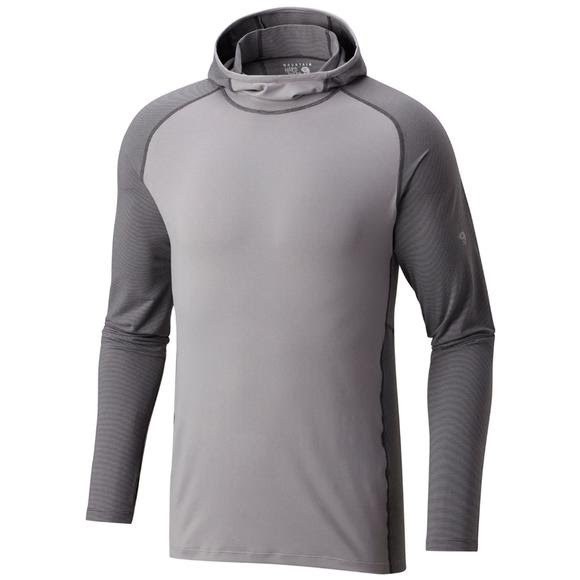 The Mountain Hardwear Men's Butterman Pullover Hoody is an adaptable pullover hoody made from our polyester-blend stretch fabric. The Butterman Hoody is made from a blended fabric that's 85% polyester, for excellent technical performance, and 15% elastane, for stretch and mobility. Quick to dry, it's as comfortable and easygoing as it is easy to care for--a new classic. The Mountain Hardwear Men&apos;s Butterman Pullover Hoody is an adaptable pullover hoody made from our polyester-blend stretch fabric. The Butterman Hoody is made from a blended fabric that&apos;s 85% polyester, for excellent technical performance, and 15% elastane, for stretch and mobility. Quick to dry, it&apos;s as comfortable and easygoing as it is easy to care for--a new classic. Stylish solid-and-stripe pattern.